Reading and share top 11 famous quotes and sayings about Narrators by famous authors and people. 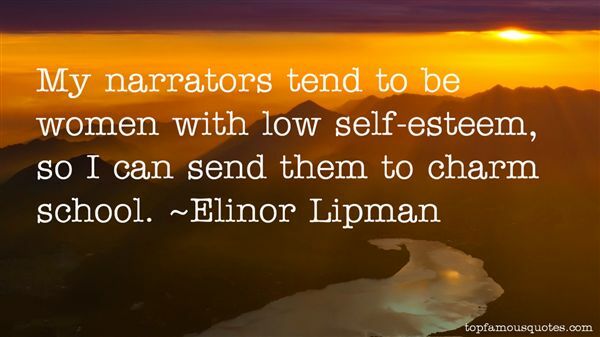 Browse top 11 famous quotes and sayings about Narrators by most favorite authors. 1. "I'm starting to think my narrators' sentences are getting too big for them, and they are getting to sound a bit samey and, more disturbingly, a bit too much like me." 2. "First-person narrators is the way I know how to write a book with the greatest power and chance of artistic success." 3. "Filmmakers who use narrators pay a price for taking the easy way: narrated films date far more quickly than films without narrators." 4. "In fiction, especially in texts that are framed by a storytelling situation, aporia is a favourite device of narrators to arouse curiosity in their audience, or to emphasize the extraordinary nature of the story they are telling. It is often combined with another figure of rhetoric, "aposiopesis", the incomplete sentence or unfinished utterance, usually indicated on the page by a trail of dots..."
5. "My narrators tend to be women with low self-esteem, so I can send them to charm school." 6. "I do not like postmodernism, postapocalyptic settings, postmortem narrators, or magic realism. I rarely respond to supposedly clever formal devices, multiple fonts, pictures where they shouldn't be—basically gimmicks of any kind. I find literary fiction about the Holocaust or any other major world tragedy to be distasteful. I do not like genre mash-ups a la the literary detective novel or the literary fantasy. Literary should be literary, and genre should be genre, and crossbreeding rarely results in anything satisfying. I do not like children's books, especially ones with orphans, and I prefer not to clutter my shelves with young adult. I do not like anything over four hundred pages or under one hundred fifty pages. I am repulsed by ghostwritten novels by reality television stars, celebrity picture books, sports memoirs, movie tie-in editions, novelty items, and -- I imagine this goes without saying -- vampires." 7. "CUSTOMER: I'd like to buy this audiobook.BOOKSELLER: Great.CUSTOMER: Only, I don't really like this narrator.BOOKSELLER: Oh.CUSTOMER: Do you have a selection of narrators to choose from? Ideally, I'd like Benedict Cumberbatch"
8. "I write almost always in the third person, and I don't think the narrator is male or female anyway. They're both, and young and old, and wise and silly, and sceptical and credulous, and innocent and experienced, all at once. Narrators are not even human - they're sprites." 9. "Narrative is an open-ended invitation to ethical and poetical responsiveness. 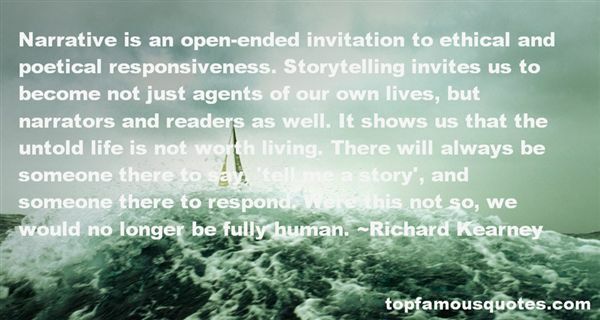 Storytelling invites us to become not just agents of our own lives, but narrators and readers as well. It shows us that the untold life is not worth living. There will always be someone there to say, 'tell me a story', and someone there to respond. Were this not so, we would no longer be fully human." 10. "Ezra clapped his hands. "all right," he said. "In addition to the books we're reading as a class, I want to do an extra side project on unreliable narrators." Devon Arliss raised her hand. "what does that mean?" Ezra strode around the room. "well, the narrator tells us the story in the book, right? But what if... the narrator isn't telling us the truth? Maybe he's telling us his skewed version of the story to get you on his side. Or to scare you. Or maybe he's crazy!" 11. "The underlying and more ominous question is whether the story of our species — the greater human narrative — has simply become too enormous, too confused and terrifying, for us to grapple with. 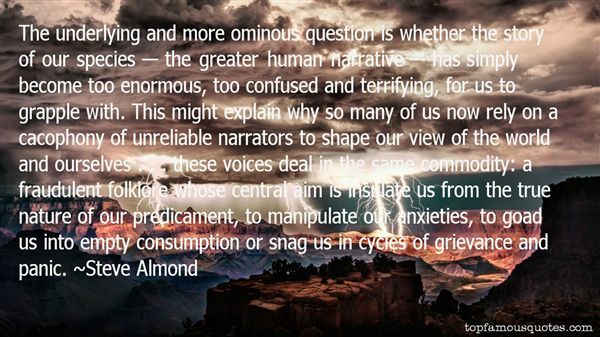 This might explain why so many of us now rely on a cacophony of unreliable narrators to shape our view of the world and ourselves . . . these voices deal in the same commodity: a fraudulent folklore whose central aim is insulate us from the true nature of our predicament, to manipulate our anxieties, to goad us into empty consumption or snag us in cycles of grievance and panic." I'm an invisible monster. I'm incapable of loving anybody. You don't know which is worse."